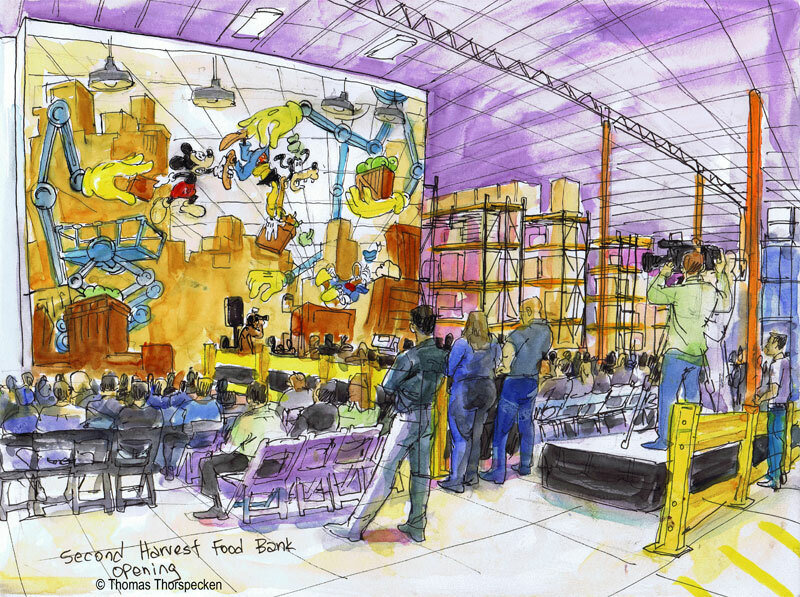 A new 10,0000 square Second Harvest Food Bank of Central Florida foot distribution center, (411 Mercy Drive Orlando FL), has just opened it's doors. I went to the dedication ceremony on March 6th. Several hundred people toured the huge facility and watched the dedication ceremony. Mayor Buddy Dyer was there and he joked that John Morgan's home was as cavernous as the warehouse. John Morgan of Morgan and Morgan Law, addressed the crowd. He mentioned that as a teen he had worked at Disney World dressing up as Pluto. He was miffed that Pluto wasn't to be found on the huge Disney mural behind him. He said that most people might say that donating the money to build the food bank was easy. Well it wasn't easy and don't be calling him for any donations soon. A woman took the stage and spoke about her family's struggles after her husband lost his job. Being proud, it was a long time before she could admit they needed help. When she finally did turn to the food bank, she was amazed at the healthy quality food they received. Now her husband is working again and they are back on their feet. The needs in the past four years have grown by 75%. Second Harvest Food Bank of Central Florida is a private, nonprofit organization that collects and distributes donated food to more than 500 nonprofit partner agencies in six Central Florida counties: Brevard, Lake, Orange, Osceola, Seminole and Volusia. Learn more about how you can donate. If you're interested in becoming a partner agency, click here. Providing access to food and other grocery products in order to meet the need. Promoting and supporting the development of our partner agencies’ ability to fulfill their missions. Mobilizing leaders and communities by bringing visibility to the invisible problem of hunger and poverty. Developing more holistic and county-specific solutions to hunger in Central Florida.